My original fabric for the borders were discarded. They just did not suit the look. Going through my stash, this stripe is better, much better. This plain red for the outer border is perfect. The size of this top finishes at 86-1/2" x 90-3/4". What started as a Bonnie Hunter leader/ender project ended up being sewn together very quickly. I just couldn't wait to see the top done and I'm glad that I didn't wait. What is up next for borders? My apple core. Stay tuned for a photo of this top. Oh yes, Happy Days Are Here Again! RM it looks fabulous! you are so busy and getting so much done! That tumbler top is gorgeous! Way to go! The tumbler top is fabulous. I have a thing for red and white quilts. I love how the stripe transitions the tumblers to the border--well done! I am going to have to make some placemats so I can play with some tumblers. 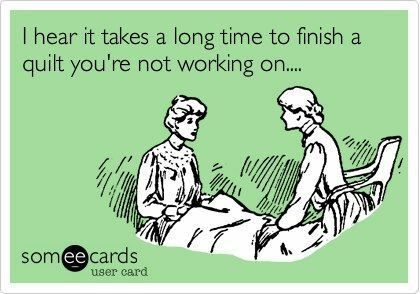 Too many projects going! But these are so cute! I can't wait to see your apple core! I know so many who have tried this pattern and never end up with a quilt. You must have magic fingers! I love using stripes/directional prints. I think you get a lot of bang for your buck using them. The red stripe border makes your little tumblers shine, shine, shine! Such a pretty quilt this is!